Tom Kelly, who directs the Inland Seas Education Association in Suttons Bay and is among the state’s foremost authorities on the Great Lakes, showed me a number of very interesting graphs earlier this week about the falling water levels in the Great Lakes. Much of the nation’s attention this summer was directed to Lake Superior, where evaporation, much lighter winter snows and unusually dry spring and summer seasons had produced miles of shoreline nobody had ever seen before. But data compiled by the Army Corps of Engineers and the National Oceanic and Atmospheric Administration shows that Lake Michigan is in worse shape. In January, Lake Michigan water levels measured at Ludington were 577.82 feet above sea level. Today, the surface of Lake Michigan was 576.27 feet above sea level, or more than a foot and a half lower since the start of the year, and about five inches lower than on November 1. It’s also, temporarily, lower than the record by less than an inch. Great lakes shipping has already been affected as cargo vessels carry less to keep from dragging their hulls on the bottoms of major ports. Municipal water intake and outfall pipes in some areas are nearing the point where they’ll be gulping or expelling air. Lakeshore owners generally like the extra beach that’s showed up in front of their homes, but in some cases shoreline owners are seeking permits from the state environmental agency and the Army Corps to pull, cover, or remove the new water grasses now growing near the shoreline, especially on the Lake Huron coast. But the most salient point in the falling lake levels is that the cycle of filling and receding seems to have been disrupted. Lake Michigan has been near record low levels for about five years now. And the lake level seems almost certain to fall below the record sustained low of 576.3 feet above sea level that was set in 1964. The National Weather Service just reported that 2007 was among the warmest years on record. The Deep South and the Great Lakes region have braved a wearying drought since the spring. San Diego forests burned last month. Atlanta has about 80 days of water left in its supply. The Colorado Plateau is in the midst of a historically long drought that is draining the Colorado River. 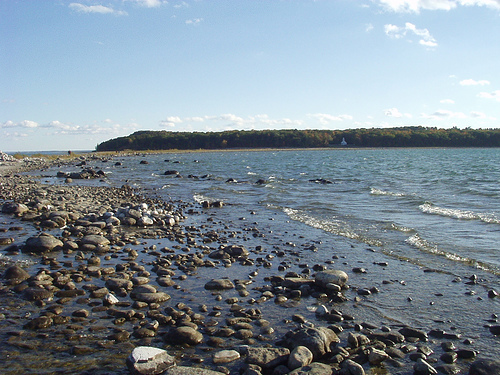 And two of the five Great Lakes are at or near record low levels. Across the globe, a freshwater crisis has dried up a quarter of China, left Africa without adequate supplies, is leading to increased drought and fire in the Amazon, and is among the causes of migration out of Central America to the United States. We thought the crisis would not appear in our midst. Guess what? It has. Pingback: Modeshift » Blog Archive » Was Jim Kunstler Right About “The Long Emergency”?